Teach your students how to think like economists. 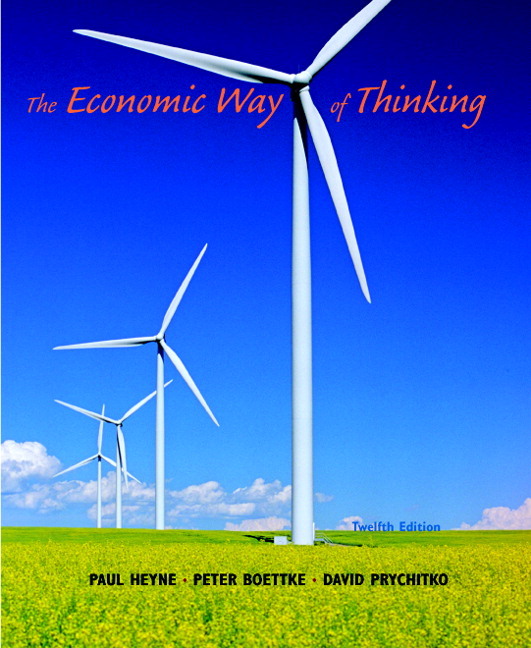 The Economic Way of Thinking goes beyond explaining the basic principles of micro- and macroeconomic analysis by showing students a method of reasoning that teaches them how to apply these principles as tools. The authors expose students to a method of reasoning that makes them think like an economist through example and application and also shows them how not to think, by exposing errors in popular economic reasoning. The latest edition has been thoroughly updated with current material. This text stresses critical thinking exercises over formal modeling and number crunching. By using unique end-of-chapter features, students are encouraged to come to a conceptual understanding over simple memorization of facts, definitions, and formulas. 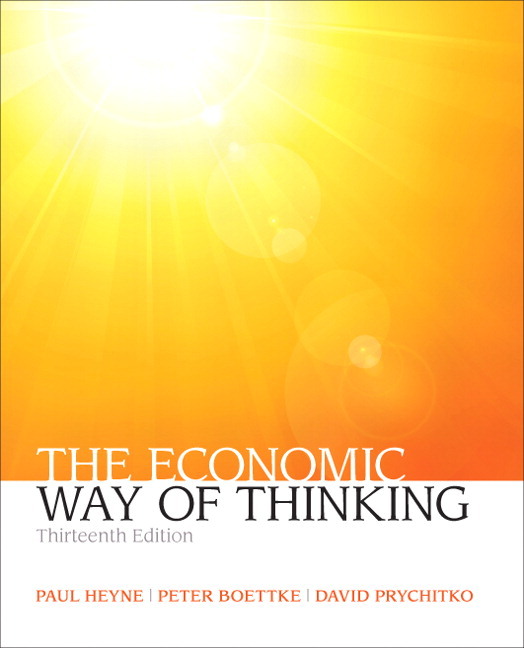 Unlike other texts, the material presented in the Economic Way of Thinking is linear and streamlined, employing a “less is more” philosophy. Students can easily focus on important topics as they read the text, helping them see the big picture. Applications Integrated into the Text: Applications play an integral part in both conceptual learning and student motivation. And unlike other texts, these applications are not to relegated to “boxed applications”. Clear, Focused Graphs: This text strategically integrates graphs only when necessary, carefully focusing them on the point at hand. Students can quickly and easily interpret these graphs, and integrate them into their overall economic thinking framework. Student-friendly Writing Style: The authors use language that speaks to students, rather than dictating to them. Clarified Continuing Theme: By making connections between different concepts and following a single continuous theme, students can get a clearer sense of the big picture and can better draw conclusions. “Index of Economic Freedom” Data: By incorporating data from the discussion of the performance of economic systems, this text emphasizes the argument that the security of property, freedom of contract, open trade and monetary and fiscal constraint are essential policy ingredients that explain why some countries perform well and others not so well. This is valuable insight about international policy issues and how they affect the economic environment for students. We discuss time preference and the role of interest rates in coordinating economic activity in Chapter 5. We have reintroduced an entire chapter on income distribution (Chapter 12). We have added a discussion of discouraged workers in Chapter 13. Our discussion of monetary equilibrium has been merged into Chapter 14 on money. We’ve updated the data and have added learning objectives at the beginning of each chapter. We discuss the Austrian theory of the unsustainable boom in Chapter 15, connect that to the interest rate presentation in Chapter 5, and apply it to the Great Recession of our recent past. The Biases of Economic Theory: A Weakness or a Strength? What Role Should Demand Play? Looking for an Apartment in the City? Read the Obituary! High-Priced Sports, Low-Priced Poetry: Who’s to Blame? “There’s Gold in Them Thar Hills!” So What? Why Does It Cost So Much to Change Bedpans? Calculating Profit: What Should Be Included in Costs? What About Those Empty Seats? What Is the Appropriate Cost? How Do People Identify the Public Interest? Is Value Added Always Positive? So How Much Money Is Out There? But Who Is Really in Charge? An Appendix: What About Gold? What Really Happens in a Recession? Why Not Government at All Levels? Who Is Rich, Who Is Poor?